“My name is Darren Hayman. I'm going to write, record and release a song every day during January 2011. They won't all be good but some might be.” is the quote at the top of the page on Darren Hayman's January Songs site. That's a pretty ambitious statement really, when you think about it. Not the “They won't all be good” bit – the releasing a song a day for a month bit. For those out of the know: Darren Hayman used to be in indie heroes Hefner who split in 2002 and has been releasing albums since 2007 under the name Darren Hayman & The Secondary Modern – the last of which Essex Arms came out last year and was by all accounts really very good. And now that's out of the way it's hard to know where to start with this review other than to say that Hayman has been either too cautiously modest, or too self-deprecating with the above inference to the quality of the songs. The first half has all been really quite good, aside from the one's I'd go as far as describing as chuffing ace. As each song has been recorded and released within hours of conception it's understandable that often the feeling is of sketches of tracks rather than completely fully fleshed out ideas. This is heightened by the comparatively short length of most of the first 16. Still, both factors add up to a collection of charm and lo-fi beauty, complimented by collaborations and keeping a strong link with his recent material. The first day's tune 'It Was Over' provides an early example of Hayman playing with a different style. Unseasonably summer, it's a rough sonic drawing of what could be a 6Music summer mega-hit. Whilst Day 2 gave us 'Bad Technology' a sonic showcase of the sweet electronic side of Garage Band. Featuring lyrics such as “wrap the flux around your heart” and “this bad technology, it breaks promises” it's more downtrodden than dystopian, but close to essential too. 'Esplanade Drive' is Hayman's “80's Synth Ballad” and features a drum machine that Flight of the Conchords would have rejected for 'Inner City Pressure'. In its critic-less dissection of ambition it recalls an uncynical Damon Albarn, circa The Great Escape. Sonically it's nowhere near this, being much less mess, for a start. Yet surprisingly, this isn't the only time that it's easy to see a convergence between Hayman and Britpop. 'Britain's In Bloom' is foot-tappingly pop like Supergrass used to be before they grew up and has a chorus that is the most likely to stay with you after the first listen. flipping out and soon regretting it. The lightness of the music juxtaposes with the emotional impact of the lyrics and stunning vocal performance. Not dissimilar on the sound, but featuring Darren Hayman himself on vocals, 'Isle of Eigg', 'Hold Back The Clock' and 'Old Man Hands' are those that most reflect the aforementioned & The Secondary Modern albums. Their subdued folksiness makes it strange to think that you've not been listening to Hayman forever. Warm and familiar like your favourite slippers. And no, I don't mean that as anything other than a compliment. 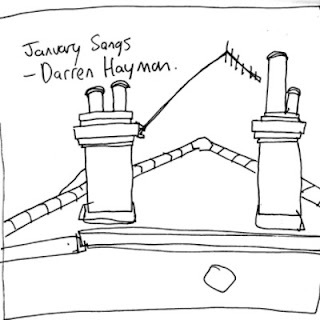 Of course, there's been several more songs since then and you can listen to all of them and download the latest ones from Darren Hayman's Soundcloud page. The second half of January Songs will be reviewed at the beginning of February.